If you have already 3D printed some models that you have downloaded or has designed some yourself while learning to work with a 3D modelling software or a CAD application you might have experienced trouble getting the damn things print right. Repeating the print process and ending up with the same problem and the object print failing can be caused by issues with the 3D model that you are trying to print – often an issue with the 3D model that may not be easily noticeable or visible at all when you open the model. When you put that problematic model in your 3D printing software such an error in the model can cause the slicing software to do a mistake giving wrong instructions to the 3D printer and when you try to print the 3D model to end up with a failed print. Some times if the mistake is bigger you might be able to spot it upon a closer inspection of the 3D model, but sometime the problem might be very small and still cause an issue or to remain unnoticed by a not so experienced person. A wall too thin and troublesome to print, a small hole between parts of the model, unconnected planes or flipped normals – different issues, but all of them can lead to trouble getting your 3D model to print well. Some times the software you use to print on your 3D printer may have some options to help you identify such more common problems before starting to print, but even if it does they are usually just to identify the presence of an issue and not to fix it automatically. You however may not be aware of the availability of such options or have software that is not designed to check and maybe fix problematic 3D models before exporting them for printing, so you need to look for alternatives. If you look around you may find some commercial products available that are designed specifically to help you with such problems, but if you are using your 3D printer just for fun at home learning and playing with it they may be too expensive for you. Fortunately there are free alternatives available, one such that is web-based is provided by the German 3D printing service Trinckle. Their solution requires you to upload the model you want checked for errors and you will get either some advice to optimize some possible weak areas such as too thin walls that may be hard to properly print or have some issues (if any) with the model fixed such as flipped normals for example or another of the already mentioned common issues. The 3D model repair service is completely free and after the analysis and fixes to your model are applied you can download back the fixed 3D model or make an order for Trinckle to print it for you and send you the final object. 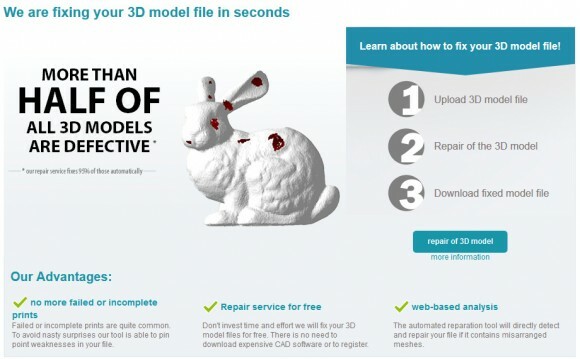 When you download the fixed file you can of course print it yourself, no obligations to use the services of the 3D printing service if you use their free 3D model repair service. The service is completely automated and quick and easy to be used, you can upload 3D models in PLY, STL or 3DS format of up to 32MB to have them analyzed and fixed for you if you think they may have an issue. Be aware however that while the service does pretty well it may also be unable to fix some more serious problems, so there is no guarantee that it will solve all of your problems, but it should do just fine in most cases.